Having a good mattress is kind of mandatory. Demand for natural latex spring mattresses is quite high in the market and if you are looking for such a mattress for your house, you can definitely try Sunrising Bedding natural latex mattress. Shipped as bed-in-box, it has fetched innumerable positive reviews and remarkable user rating as well. Sunrise Bedding mattress's 8 inch version comes with 3 different layers wrapped in a breathable cover. The outer most cover of Sunrising Bedding is made from soft cashmere wool, which is by nature porous and breathable. It helps regulate regulate body temperature. The second inline is the protection layer that is a non-toxic cotton fire protection layer. The topmost layer in Sunrising Bedding mattress is designed to offer a comfortable and firm sleep surface. 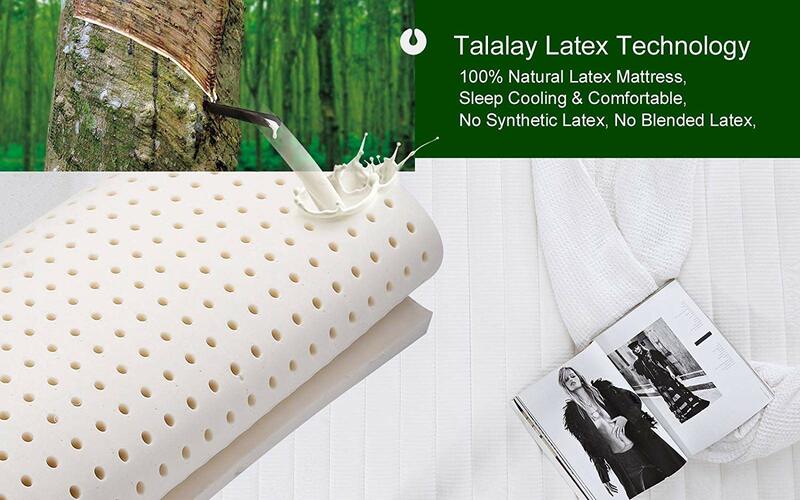 The upper latex layer combined with innerspring coil layer offers a breathable sleeping surface. Both these layers work together offering contouring qualities of a foam mattress and spring and bounce of a coil mattress. Material quality needs a special mention here. Owing to best quality material being employed, the mattress is free from all kinds of toxic chemicals, which otherwise are common with memory foam mattresses. The base layer of Sunrising Bedding 8-inch natural latex mattress is the main support on which your whole body weight rests. The bottom most coil layer of the mattress is made up of individually wrapped high-carbon steel coils. These coils are not inter-connected and are independent of one another. This helps in significantly minimizing motion transfer, resulting in minimal disturbance even when your sleeping partner frequently changes positions in the night. Additionally, to remove that typical annoying coil sound, these coils are again individually wrapped in fabric. Made from high quality carbon steel, the coils are durable and add longevity to the mattress itself. This is perhaps the reason why the company is offering 20-year warranty. The firmness of Sunrising Bedding latex mattress stands at 6.5 on a scale of 1 to 10. This is because the base layer of the mattress is made up of a coil layer. High carbon steel coils are used in the base for complete support and firmness. With these coils in place, there are no chances of any kind of sagging. Even with rough and regular use, the mattress has no chance of sinking in. The coils are encased in separate and individual pockets for providing localised bounce in the mattress. Along with this, there is cushion firm feeling from the cooler inner spring bed. There is an extremely comfortable latex layer which helps in providing relief to the various pressure points on shoulders, back and waist. Whether you sleep on the back, side or stomach, this mattress offers excellent comfort and firmness. Few of us have a tendency of tossing and turning in bed too much causing disturbance to sleeping partner. However, such motion transfer issue is taken care of extremely well in Sunrising Bedding mattress. Motion transfer is effectively minimized as coils are independent of one another. These coils are again individually wrapped in fabric. This, additionally, helps in removing annoying noise which otherwise had been a typical problem with traditional innerspring mattresses. Also, since the coils are made from high carbon steel, there are absolutely no chances of sagging at all. The edge support in Sunrising Bedding mattress's 8 inch version is more than just satisfactory. The support is neither very rigid nor very soft. The sides and edges have proper support so that sitting is not a problem in any way. Tempered steel coils are used in the edges for spring support. Sunrising bedding 8 inches mattress comes with a 20-Year warranty and a massive trial period of 120 nights, which means about 4 months. When a company offers trial period as well as warranty for such long periods of time, one has to understand that the product is of great quality. Sunrising Bedding 8-inch natural latex mattress has become one of the most favourite choices for people. One main reason is that the mattress fits in all kinds of bed frames including platform, box spring, slats, trundle beds, bunk beds etc. The layer construction is designed in such a manner that it offers ultimate comfort and relaxation to the sleeper, whether you sleep on back, side or on the abdomen.